In less than eight hours, enough sunlight hits the Earth to meet all of humanity’s energy needs for a year. According to research published by the International Energy Agency, the world consumed 18.3 terawatt years (TWy) of energy in 2014. It only takes eight hours of sunlight to be able to produce 21 TWy of solar energy. And the cost of producing it has dropped dramatically in the last few years. So why aren’t we using it to power the entire planet? The main issue is storage. The sun doesn’t shine at night, so the energy has to be stored until people need to use it. As the cost of producing the energy has dropped—a 2016 Lawrence Berkeley National Lab study showed that solar project costs in the United States had dropped by two-thirds since 2009—demand has gone up. As a response, utilities have installed two and a half times more solar technology than residential and commercial consumers combined. Our current storage options can’t keep up. Utility-scale solar arrays require big storage. In Australia, Tesla recently installed a massive lithium ion battery array to store renewable energy, but lithium is not an unlimited resource, and batteries are not ideal for all situations—many Albertans know the lithium ion batteries in their phones don’t like the cold. If we plan to move the entire world to sources like solar and other renewables, we need multiple ways to store the power. When the $75-million University of Alberta Future Energy Systems research initiative launched at the end of 2016, tackling this problem was a major priority. Among the scientists receiving funding from the initiative is chemist Steve Bergens. He’s working on a utility-scale alternative that would take advantage of existing infrastructure and save chemical batteries for smaller-scale uses. Today’s most common fuels are hydrocarbons like natural gas. When those hydrocarbons are burned, the carbon is released into the atmosphere as the greenhouse gas CO2. To avoid CO2, we could adapt our entire energy system to burn pure hydrogen, but Bergens thinks that proposition isn’t realistic in the short term. Theoretically, that process could be reversed: sunlight could be applied to water and carbon dioxide, creating synthetic natural gas with pure oxygen as a byproduct. When that fuel is burned, the carbon dioxide would never need to be released—just captured and recycled to make more synthetic fuel. The formulas check out, but few things are as easy as they look on a chalkboard. Mona Amiri is a post-doctoral fellow working with the team in Bergens’ lab to develop catalysts that can make the chalkboard reaction happen in real life. Building at the atomic level and in a modular fashion, she and students Chao Wang and Octavio Perez are creating single molecules that each perform an individual function in the overall process. These molecules can be optimized and studied separately, then be easily assembled like building blocks –– or even self-assemble –– to function as a single unit. This approach allows the team to quickly identify weak spots, to switch individual components, and eventually to reduce engineering costs by carrying out the entire process in one unit. It only makes sense, however, if the catalysts and components are affordable. With that in mind, Amiri and the team are developing new catalysts based on common elements like iron. So far these more common molecules are not proving as efficient or long-lasting, but she is confident they can be refined into useful alternatives. “It will be necessary to blend efficiency, lifespan, affordability and availability,” she said. When she and Bergens’ team find the right balance, the resulting technology could be a crucial stepping stone. With the right catalysts, natural gas plants around the world could have solar fuel plants built next to them, capturing their CO2 and reacting it with water and sunlight. The result could be a completely closed carbon system in which the plants generate power through combustion, but CO2 is never released into the atmosphere. Bergens has some ideas about what that new fuel could look like. 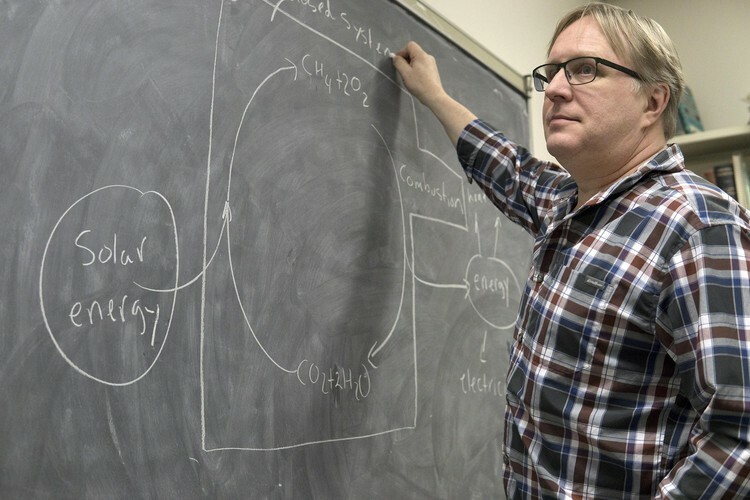 He draws a molecule on his chalkboard that bonds hydrogen with another common element, and would emit nothing but water when combusted—but then he erases it quickly.